i finally got my hands on ramps and fiddleheads last week. the best part about that, other than how delicious they are, is that it took more time to buy them and bring them home than it took to prepare them. things taste so good right now, in season, that you don’t have to want to mess with them much. i brushed the ramps with olive oil before laying them in a searing hot grill pan. i blanched the fiddelheads for three minutes before sauteeing them with some garlic in browned butter. on the side, some salad, bread and a white wine and tarragon sauce aioli that took less than one minute to whisk up. so here’s to keeping it simple this spring and enjoying everything hitting the farmer’s markets in the coming weeks. 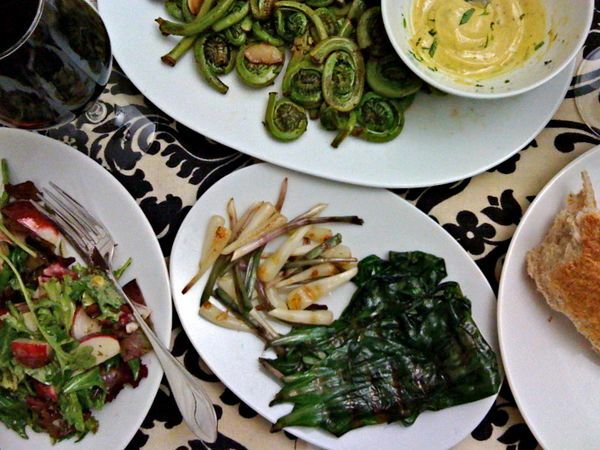 here are some of my favourite ways to enjoy ramps, green garlic, artichokes and more. if you’re lucky enough to have a farmers market near you, go soon and often. try everything, and check back here because i will be too.